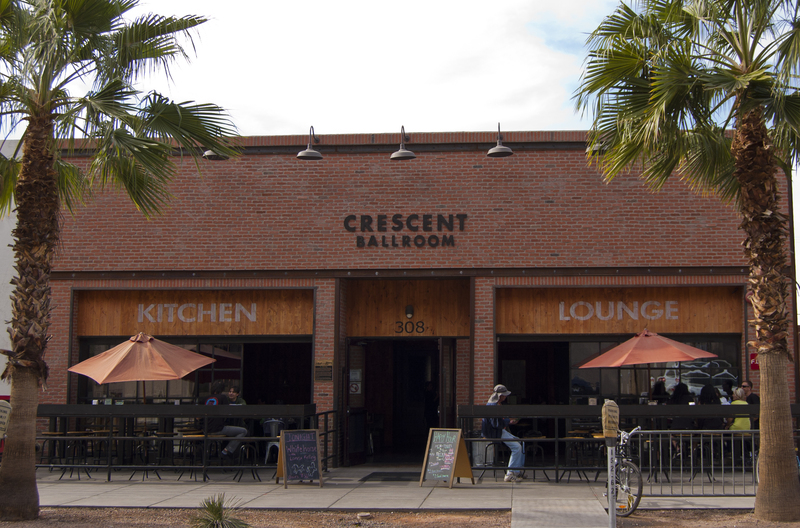 Everything you needed to know about Crescent Ballroom. Opened in October 2011, owner Charlie Levy transformed the F.L. Hart Garage into the live music venue it is today, hosting a wide range of local and national musicians and artists. This triple-threat hosts seven nights of live music and a full-service bar, as well as two well-known chefs — Chris Bianco of Pizzeria Bianco and Doug Robson of Gallo Blanco — in its kitchen, Cocina 10. The locally-sourced menu is comprised of what the trio calls “Mexican-accented road food,” featuring common finger foods with a border-inspired twist. As expected, Bianco and Robson’s dishes are nothing short of delicious — and very reasonably priced. Not only are the chips and salsa uber cheap ($2), but they taste fresh and insanely good (not to mention at midnight after a few drinks). Our favorite menu item? The Quesadilla Nortena, filled with a blend of oaxaca and sharp cheddar cheese. Don’t forget to add pork or veggies — delish! Under $10, too. Try anything on their menu, and you won’t be disappointed. Oh, and Crescent is open for lunch, too. You’ll find drinks at two designated bar areas — one in the lounge and another in the main stage area. If you plan to drink in the lounge and venture into the main stage area, ensure your drink is in a plastic cup. You can’t take glass in the main stage area. Everything here is decently priced. Blue Moons go for about $4 or $5, and mixed drinks run anywhere from $5 and $10. The prices are reasonable with the drinks nowhere near overpriced as those at the Marquee ($7 or $8 for a Blue Moon?!) or US Airways or Comerica where you’ll get a Bud Light for $9. Screw that noise. The main stage has awesome sound — probably the best in the Valley. From indie and folk to techno and rock, everything always, always, sounds great. Plus, you can catch free music in the lounge area. DJ Sean Watson, anyone? Purchase your tickets at least a day before the show. Yes, you’ll have to pay some sort of tax or processing fee, but it’s better than showing up the day of the show, and it selling out. Crescent is all about supporting local music, and there have been a few times when a few of the larger local acts (Mergence, Black Carl and What Laura Says, for example) have attracted quite the crowd, comprised of show-goers with the same thought process you may have had: “I’ll just pay at the door; there’s no way this will sell out.” Needless to say, the Crescent staff had to turn people away due to reaching its maximum capacity. So, better safe than sorry. If you absolutely need to attend a show, buy your tickets in advance! Don’t risk it. Crescent may attract huge acts/musicians/bands/etc., but it’s just a mid-sized venue after all — with a maximum capacity of 543. The parking at Crescent is pretty limited when it comes to metered parking near the entrance. With anywhere from 10-15 metered spots, you’d be lucky to snag one — unless you get there early enough. They are, however, free after 5 p.m. on weekdays and free all day on Saturdays and Sundays. Behind Crescent Ballroom. Enter by Van Buren, immediately before 3rd Avenue. South across Van Buren. Enter from Van Buren or 2nd Avenue. 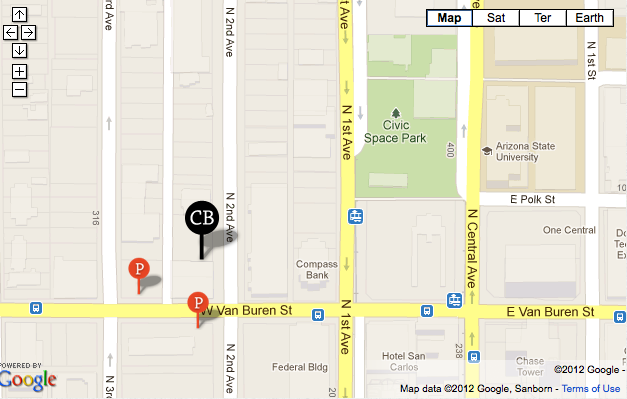 There are a couple ASU parking lots just north of the venue and across the street from each other at which many park. Just read the signs before you park. Some many require an ASU parking pass, but check the times. You may be able to park there for free after 5 p.m. If you can, just take the light rail. Far easier than finding parking. In the lounge/restaurant area, you’ll find single-stall/single-toilet, unisex bathrooms. These are kept pretty clean — even on busy/sold-out nights. In the main stage area, you’ll find two bathrooms, one designated for the ladies and another for the fellas. These have plenty of stalls, and while lines may form, they go pretty quickly. We’ve never had to wait in line for a ridiculous amount of time. Crescent has a patio on the left and right side in the front of the building where you can smoke. But beware: 80 percent of Crescent show-goers are smokers or have at least one friend who’s a smoker … so expect to smoke your cig between bands with nearly everyone else at the show that night. In other words, you’re going to get pretty damn cozy with the rest of the smokers. But hey, that’s what makes the night memorable, right? Have any more tips you’d like to share? Feel free to leave a comment, and we’ll add it to the post!